Birds breeding again in our garden! Woo hoo! 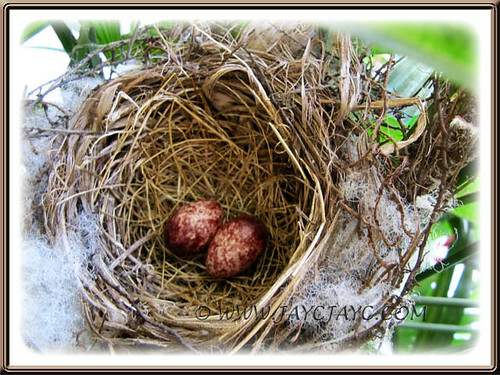 Nesting on the same potted Lady Palm trees at a corner of our porch that seem to be a haven for potential breeders. The same species, Pycnonotus luteolus (White-browed bulbul) Pycnonotus goiavier (Yellow-vented Bulbul) that never tire of visiting us and throwing such wonderful surprises and happenings! We’re extremely thrilled, to say the least…I especially. It has been a long wait to experience once again procreation at our doorstep. Keeping our fingers and toes crossed that this time around, the parents-to-be will succeed in starting their family with 2 new additions! Unlike last year’s foiled attempt in hatching, which was so heartbreaking to witness. on 25 Feb. or 1-2 days before. How colourful and beautifully spotted! There’s much activity by the female bird that I can observe through the lace curtains as I work on our iMac facing outside. From the time the eggs were laid until today, she has been very busy flying in and out ever so frequently, trying to hatch her eggs dutifully. Somehow, I think she’ll be a mum very soon, in a matter of days! We praise and thank God for being able to experience such wonders of nature. It’s a wonderful indescribable emotion! We feel so blessed indeed! 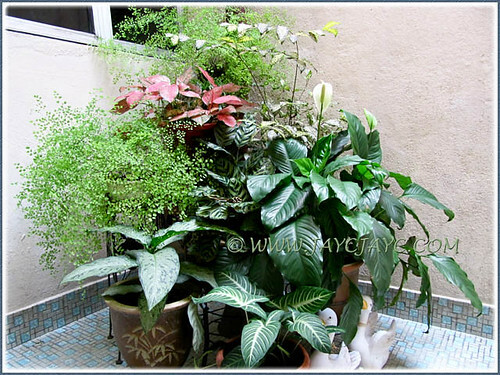 Enjoying nature, outside in the frontyard garden with the birds, bees and butterflies, as well as the flowering plants, while inside…..
greeting us with their happy faces and luxuriant growth, and bringing joy and warmth to our hearts daily. Sharing a couple of photos to show their bright and contented faces! 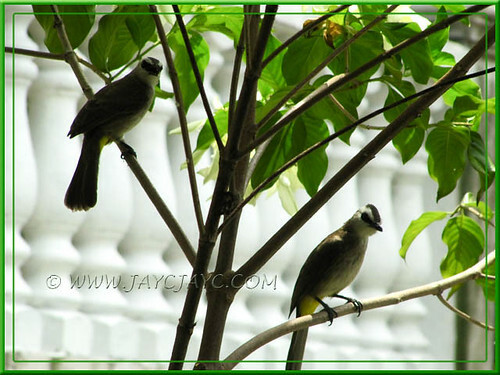 Check here for an update on the White-browed Yellow-vented Bulbuls breeding event. how exciting – I am carfeully nurturing some butterfly chrysalis and feel the same – so blessed to witness events like this in our own backyard. I look forward to seeing some baby bird photos soon! Indeed, Gillian! More exciting over your end as you’re actually involved in the process, yes? Hope to read your success story someday soon. As of today, we’re still waiting to see the hatchlings…,?? 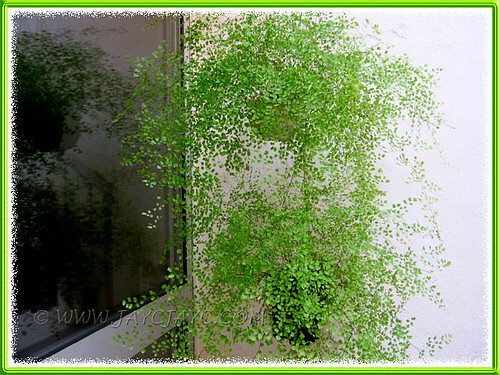 A bird nest on your potted plant? Oh wow! I didn’t ever imagine that this could be possible. The birds are really beautiful, not the usual ones I see around my garden. I’m so extremely happy for you, Jacqueline!